True confessions: this was my first ever Ronald Dahl book to read. Bookworm1 and I launched into this particular book and, I have to say, he stayed tuned through the whole story. He followed along. He knew the characters. He enjoyed the story. It's fun to say "Boggis, Bunce and Bean" really fast. Mr. Fox and his family of foxes were intriguing. For those of you unfamiliar with the story- it is about a fox (and a fantastic one at that, of course!) who steals food for his family from farmers Boggis, Bunce and Bean. The three gentlemen are sick of having this fox nab their goods and set out to catch him. However, Mr. Fox is a sly one and the farmers never receive the satisfaction of capturing their arch nemesis. The story is a quick read at only eighty-one pages long. I wouldn't have minded the book so much, honestly, if Dahl hadn't used words like "stupid" and "dumb" which - eh. Maybe you wouldn't be as picky as me. I don't like my three year old using such vocabulary. It's not something I'm going to introduce - and certainly not words we will make a habit out of using in our home - so I just changed the words as I read it aloud. I was glad to read this book aloud to Bookworm1. It was a fun experience. I could change the language to suit us. I just wouldn't read them for personal pleasure and if I were choosing a read-aloud, I probably wouldn't go out of my way to purchase another Dahl book. Not to say it won't happen, just sayin' he's not my first pick. After reading the book we watched the movie as a family. And after watching the movie as a family, we wondered why we had chosen to do so. The hands-down best part of the movie is that it's animated with stop-motion animation. I thought it looked visually appealing and enjoyed the movie for that aspect alone. (I'm awed by the crazy amount of work and patience such a full-length film would take!!!) Jonathan didn't like it quite so much. Bookworm1 didn't seem to notice. 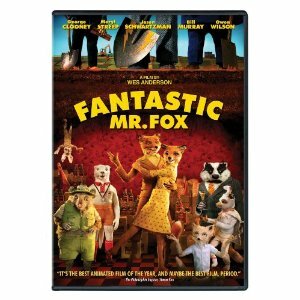 George Clooney gives Mr. Fox his voice and I confess to not really caring for the Fox much as a result. I could only hear Clooney's voice and had this picture of Oceans Eleven in my head. I'd have preferred a lesser known to give the Fox his character so that I could have engaged with Dahl's story a bit more. Not to say that there was a whole lot to engage with, as the screen writers had a hayday in presenting, in some respects, a brand new story to the screen audience. In short, we give a thumbs down to the film (but I did like the stop-action) and a hand wiggle to the book for a memorable reading experience. Not a loss, but not a lot to say here either (obviously.) A big, "whatever" is more like it. That's kinda how I felt about it. I feel sure we'll probably tackle another Dahl as a read-aloud one of these days (probably Charlie and the Choc. Factory next), but again, as a read-aloud so I can edit if needed. I wasn't knocked out by the movie either. Definitely one of those where you should go with the book over the movie! i haven't read this one i read james and the giant peach and charlie and the chocolate factory. I just listened to The BFG by him. Also has some idiot, stupid type of language. The imagination and stories are good...but I agree...hard to love as a parent of a young child. I only read Fantastic Mr Fox once...and it didn't leave much of an impression on me, honestly. "I could only hear Clooney's voice and had this picture of Ocean's Eleven in my head."---LOL! My son likes "The Magic Finger" by Dahl but I admit that it's one of those he's read on his own so I don't know what it's about. Thanks for this honest assessment. My middle child is on a Roald Dahl "kick" right now, and I'm not impressed myself. I'd like to forgo the movie, if possible. My kids are asking if they can watch. Hopefully we can skip this one! I've only ever read both Charlie books and James and the Giant Peach. I like them, but I've never felt the need to read anything else he's written. "eh" sums up my opinion of Roald Dahl. Ive never read anything by him of my own free will, but my second grade teacher read us Charlie and the Chocolate Factory and its sequel. I remember looking around at the other kids and wondering if I was the only one who thought it was weird that she was reading us a story about a girl literally exploding. I haven't read this one but my hubby did a family read aloud with the 2 Charlie books. We enjoyed them - sort of. I think my very literal son had a difficult time with the fantasy part of the stories. So I'm left with the impression that Dahl is "eh" all the way around. After thinking on it, the only other book/movie I'd REALLY like to read/see of his is Charlie and the Chocolate Factory, but that's mostly because I hear so many cultural references to it and I never have any idea what people are talking about - other than the title, of course! I highly recommend watching the old version. As much as I like Johnny Depp in Pirates I think he's just creepy in Chocolate Factory. Although perhaps it's more true to the story that way. Who knows! My dd8 is reading one Dahl book after another and most recently read and loved Matilda. I wonder if Dahl's books (and their quirky bits) appeal to children and not so much to adults. Babar (the elephant) books are like this to me. I can barely stand to read them aloud, but my children love the sound of the words. 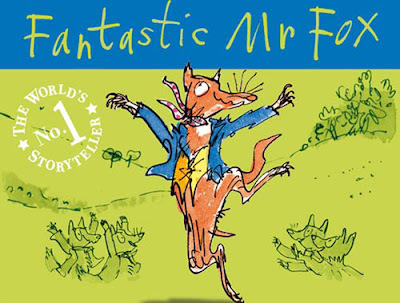 Wow, real lack of Dahl affection in the comment stream...I know this is coming in very long after you review, but I have to say that there are MUCH better Dahl books than Mr. Fox. Matilda, the two Charlie books, or James and the Giant Peach are all far better. Not necessarily for everyone, but they're a lot of fun in a wild, highly implausible way...and Matilda is particularly good for book lovers.